The following article is adapted and abridged from Workers Vanguard no 887, 2 March. if it were traced directly back to Tehran. A US bombing campaign would target Iranian air bases, naval bases, missile facilities and command-and-control centres. At Washingtons behest, the UN Security Council in December demanded that Tehran halt its uranium enrichment programme and imposed a first round of sanctions on Iran, barring technology sales that could be used for nuclear or missile development. Washington imposed additional sanctions targeting specific Iranian banks and other companies. This came after almost three years of inspections in which the International Atomic Energy Agency (IAEA) found no evidence of a nuclear weapons programme. The British Labour government is acting as Bushs hard cop against Iran. Foreign secretary Margaret Beckett insisted it was clear Iran was still enriching uranium (Guardian Unlimited, 22 February), while prime minister Tony Blair said: the tougher we in the international community are, the more likely we are to get the result we want. Any sign of weakness is lethal (Guardian Unlimited, 27 February). According to the Observer (25 February), a Foreign Office official said that the key now is to ratchet up the pressure by getting the toughest possible new UN resolution capable of winning not only American and EU support but that of a more sceptical Russia and China as well. As for the EU, its foreign policy chief Javier Solana, who last year spearheaded talks with Tehran on behalf of the EU and the UN, commissioned a report which is said to indicate that Iran will be able to develop enough weapons-grade material for a nuclear bomb and there is little that can be done to prevent it (Financial Times online, 12 February). UN sanctions are having a marked impact on the Iranian economy, especially on oil production, its lifeline. A number of oil fields are in dire need of modern technology to reverse their normal decline (such as by reinjecting natural gas to flush out more oil), for which Iran needs foreign technical expertise. US officials have warned oil companies that they risk financial sanctions if they help promote Irans oil development. Imperialist military threats are also having an economic impact. Oil companies are simply assessing risk, including what some see as the real risk of a military strike against Iran, said a former State Department official. Some are deciding its not worth it (New York Times, 13 February). In February, stock markets around the world took a huge hit, with US shares marking their greatest losses since markets were reopened after the September 11, 2001 attacks. While the sell-off was triggered by a large drop in Shanghais stock index, the Financial Times online (28 February) reported that concerns over Iran, worries about the US subprime mortgage market and a warning from Alan Greenspan, former chairman of the Federal Reserve, about a possible US recession punctured recent market optimism. It takes some chutzpah for the US and British rulers to complain about Iranian interference in Iraq. The destruction of Iraqi society under imperialist occupation has engendered the horrors of mass murder and population expulsions. Almost daily, scores of civilians die in the ethnic and communal slaughter unleashed by the war and occupation. Bodies, often showing signs of hideous torture, turn up constantly in sewers and garbage dumps, victims of murderous militias and death squads that often overlap with the police and military. The flight of Sunnis and Shiites from once-mixed neighbourhoods has turned into the greatest refugee crisis in the Near East since the Zionists 1948 expulsion of Palestinians and the creation of Israel. According to the UN, two million Iraqis—about eight per cent of the pre-war population—have fled the country, mostly to Jordan, Syria and Lebanon. Iraqs smaller Christian and other minorities are threatened with being eradicated from their homeland. Blair made his long-awaited announcement about troop reductions in Iraq, amounting to withdrawal of about 1600 troops out of a total of 7100 (fewer than previously indicated) even as he also made it clear that British forces in Afghanistan are to be beefed up. A report by Patrick Cockburn in the Independent (23 February) contradicts the rosy picture painted by Downing Street of British troops handing over power to the Iraqis, saying: southern Iraq has, in effect, long been under the control of the Supreme Council for Islamic Revolution in Iraq (Sciri) and the so-called Sadrist factions. The Financial Times online (22 February) describes the partial withdrawal of troops as the beginning of the end to a damaging and discredited enterprise, noting that in large part it means leaving swaths of the south under the control of Shia paramilitaries and an assortment of local clans and bandits—even if they are wearing crisp new Iraqi uniforms. 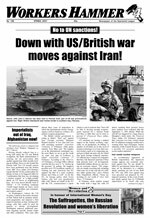 In the leadup to the US/British invasions of Afghanistan and Iraq, we called for the military defence of both countries without giving any political support to the reactionary Taliban cut-throats or the bloody capitalist regime of Saddam Hussein, which had slaughtered thousands of Communists, trade unionists, Kurds and others. Today, we call for the immediate and unconditional withdrawal of all US and British troops from Afghanistan, Iraq and Central Asia. As we did when Bush and Blair launched these wars under the rubric of the war on terror, we call on the British proletariat to wage class struggle against the capitalist rulers at home. When the US invaded Afghanistan and Iraq, reformist groups such as the Socialist Workers Party (SWP) and Socialist Party did not even raise the elementary call for the military defence of those countries. In the face of imperialist nuclear blackmail against Iraq, they do not mention the fact that Iran needs nuclear weapons to defend itself against attack. The Stop the War Coalition (StWC), built by the SWP, bases its policy on pleading with the British imperialist rulers to reorient their priorities and to end the special relationship with US imperialism. As a Socialist Worker article (12 August 2006) put it: The main task of the anti-war movement in Britain is to force our government to break with George Bushs imperial project. The call for British imperialism to distance itself from the US—long upheld by little England Labour lefts such as Tony Benn—does not oppose British imperialism as a system, but merely demands a change in its foreign policy. This view is widely supported in the bourgeois press, thus the Independents political editor Andrew Grice wrote an article (7 February) titled Blairs defence of special relationship with US has hollow ring, while Claire Short, who resigned as Blairs international development secretary over Iraq, claimed the government was humiliating Britain by being an echo of US foreign policy in the region (Guardian Unlimited, 28 February). The reformists couple this with time-worn calls for money for schools and the National Health Service, not Trident nuclear missiles, absurdly demanding that the rulers of the capitalist profit system serve the interests of those they exploit and oppress. As the SWPs description of Her Majestys government as our government shows, the reformist lefts fundamental allegiance is to bourgeois democracy: the political shell for the dictatorship of the capitalist class. Fostering illusions in the Mother of Parliaments, Socialist Worker (17 February), in an article mobilising for the 24 February demonstration for No Trident/Troops Out of Iraq complained that the complicit House of Commons gives no voice to the majority feeling in Britain against the war, adding that we want no more Bush wars against Iran or anyone else. Andrew Murray, chair of StWC argued: it is past time to bridge the gulf between parliament and people that the Iraq war has opened up. The people will be on the streets once more next Saturday, demanding that our troops come home from Iraq, that we abandon our nuclear weapons folly and disengage from George Bushs rolling war. Since no MP seems to have a better idea, let the peoples will prevail (Guardian, 17 February). For Marxists, the British imperialist troops are not our troops. Moreover, mass slaughter is not due to a misguided foreign policy but is the concentrated expression and ultimate logic of the normal brutal workings of the capitalist system. The atrocities visited on the peoples of Iraq and Afghanistan, the pounding attacks on the lives and livelihoods of working people and minorities in Britain, the US and around the globe—this is the face of imperialism, of the irrational, anarchic, profit-driven capitalist system in its epoch of decay. The only road to putting an end to the horrors engendered by this system is that of socialist revolution. British imperialism—which ran the world with racist, militaristic brutality when it had the wherewithal to do so—is today weak and decrepit and therefore dependent on the US to defend its interests abroad. To lead the British proletariat in smashing the imperialist order requires a revolutionary workers party, forged through the struggle to break the working class from its allegiance to Labourite reformism, which has always served the interests of British imperialism at home and abroad. Hersh noted that with the two carrier strike groups near Iran due to be relieved in the spring, there is worry within the military that the two groups may be ordered to stay in the area after the new carriers arrive. The former intelligence official told him that contingency plans allow for an attack order this spring. Many commentators have said that the US is looking for a new Tonkin Gulf incident, referring to the cooked-up 1964 attack on a US warship by North Vietnamese forces that provided the pretext for a massive escalation of American forces in Vietnam. To bolster Washingtons claims that the highest levels of the Iranian government were targeting US forces in Iraq, American officials pointed to captured armour-piercing explosives that they said were fabricated in Iran. But attempts to whip up anti-Iran sentiment are falling flat. First it was revealed that a press conference originally scheduled for late January had been repeatedly postponed because the evidence was so dubious that no official in Washington would take responsibility for it. (The briefing was finally presented off-camera by anonymous officers in Baghdad.) Then the chairman of the US Joint Chiefs of Staff contradicted the revelations, insisting that he saw no evidence of Iranian government involvement. Bush had to admit that he did not really know if attacks were ordered from the top echelons of the government in Tehran (New York Times, 15 February). As revolutionary opponents of British and US imperialism, we recognise that when the insurgents in Iraq carry out strikes against the imperialist occupiers, such acts coincide with the interests of the international proletariat. However, we do not imbue these forces with anti-imperialist credentials and stand in intransigent opposition to the murderous communal violence that is often carried out by the very same forces fighting the occupation armies. Should the Iraqi proletariat raise its head, it would face not only the savagery of the imperialists but also the brutality of the reactionary Islamic fundamentalists and bourgeois nationalists that dominate the resistance. In regard to the hysteria over Iranian nukes, as the UN Security Council considered imposing further sanctions, the Guardian (23 February) reported: Much of the intelligence on Irans nuclear facilities provided to UN inspectors by American spy agencies has turned out to be unfounded. In the 1980s, when Washington and London were funnelling vast quantities of arms and money to the Islamic fundamentalists fighting Soviet troops in Afghanistan, the CIA sought to cover its tracks by supplying the mujahedin with Russian guns purchased from international arms merchants. Imperialist support to religious reaction in Afghanistan demonstrated how US and British imperialism fostered the growth of Islamic reaction during the Cold War as a counterweight to Communism and secular nationalism in the Muslim world. While the bulk of the left howled along with the imperialists against the Soviet intervention, we said, Hail Red Army in Afghanistan! We noted this was one of the few genuinely progressive acts by the Soviet Stalinist bureaucracy, offering the possibility of extending the social gains of the 1917 Russian Revolution to the oppressed peoples and women of Afghanistan. The Kremlins treacherous withdrawal of Soviet forces in 1988-89 was the opening for the victory of imperialist-backed counterrevolution throughout Eastern Europe and within the Soviet Union itself. The restoration of capitalism in Eastern Europe and the former Soviet Union—a historic defeat for the world proletariat—has brought devastation to the working people of those societies and emboldened the imperialists in their attacks globally while fuelling the resurgence of religious reaction throughout the world. The Iranian clerical regime would be perfectly amenable to a reconciliation with Washington, if conditions permitted. The Iranian mullahs observed a tactful silence during the 1991 Gulf War against Iraq. They strongly encouraged the US invasion of Afghanistan in 2001 and played a key role in the negotiations that set up a quisling government in Kabul under Hamid Karzai. Since then, Tehran has arrested hundreds of suspected Al Qaeda fighters streaming into Iran from Afghanistan, turned them over to Saudi Arabia and other countries and provided names, photographs and fingerprints to US intelligence officials. According to a number of press reports, Tehran offered in 2003 to end its military support for Hezbollah and Hamas and to help the US stabilise Iraq in return for Washington lifting sanctions and dismantling the Mujahedin Khalq, an Iranian opposition group with bases in Iraq. The offer was reportedly rejected out of hand by vice-president Cheney. The reactionary 1979 Iranian Islamic Revolution that overthrew the CIA-backed Shah was supported by the bulk of the left internationally in the name of anti-imperialism. This included the pro-Moscow Tudeh (Masses) party in Iran, which had a base among the countrys strategic, heavily Arab oil workers. Uniquely on the left, the International Communist League (then the international Spartacist tendency) gave no political support to Ayatollah Khomeinis forces. We warned that absent a decisive break by the working class with the Islamic forces, the 1978-79 upheaval would have a disastrous outcome. We said: Down with the Shah! Dont bow to Khomeini! For workers revolution in Iran! After taking power, the mullahs enslaved women in the veil, slaughtered thousands of leftists and trade unionists and intensified repression against Kurds and other minorities. The current regime has continued the murderous repression. On 24 February, Iranian soldiers near the Turkish border killed 17 militants associated with the Party of Free Life of Kurdistan, an off-shoot of the Kurdistan Workers Party based in Turkey. Iranian president Mahmoud Ahmadinejad, who says that Israel should be wiped out from the map of the world, has called the slaughter of six million Jews in the Nazi Holocaust a myth and last year organised a conference with Holocaust deniers from around the world, including outright fascists. In one significant way, Iran is, in this period, an anomaly in the Near East. The growing opposition in that country to the current regime appears to have a significant secular component, as many aspire to free themselves from stifling religious rule. Ahmadinejad took the presidency in June 2005 having promised to provide more jobs, fight corruption and redistribute wealth. However, inflation has exploded, with the price of staples like bread and meat rising as much as 25 per cent, students are disaffected, workers strikes have been growing and the Kurdish and Azeri north, the Arab southwest and the Baluchi southeast are simmering. In Decembers municipal elections, the presidents political allies suffered an embarrassing defeat. It is the task of the working class in Iran, leading women, national and ethnic minorities and all the oppressed behind it, to overthrow the Persian-chauvinist Islamic regime. Key to this perspective is the forging of a Marxist workers party. Such parties must be built throughout the Near East to unite the proletariat—Arab, Persian, Kurdish and Hebrew, Sunni and Shiite, Muslim and Christian—in struggle against imperialism and against the Zionists, mullahs, colonels, sheiks and all the other capitalist rulers. The fight for workers rule in the Near East crucially includes shattering the Zionist garrison state from within through Arab/Hebrew workers revolution. This is the Trotskyist perspective of permanent revolution, which vitally includes the fight to extend working-class rule to the imperialist centres, not least through the struggle for socialist revolution in Britain and the US. In the struggle for a socialist federation of the Near East, Marxist workers parties are essential to break the proletariat of the region from fundamentalism, nationalism and illusions in imperialist democracy. The Stalinised Communist parties of the Near East, which made a mockery of this revolutionary perspective with their support to various bourgeois forces, share responsibility for the growth of Islamic fundamentalism among the working and oppressed masses. As further sanctions loom, the Iranian government has taken the just stand that it will defy UN strictures against its nuclear development. While Russia accommodated the US by voting for UN sanctions, it has also provided Iran with $700 million worth of TOR-M1 anti-aircraft batteries, whose likely target in the event of conflict would be American fighters and bombers (New York Times, 18 February). Russian leaders were already furious over the eastward expansion of NATO which, having signed up the former Soviet republics of Latvia, Estonia and Lithuania, is now making overtures to Georgia and Ukraine. At a security conference in Munich in February, Russian strongman Vladimir Putin lashed out at the US over its plan to install a missile defence system—supposedly directed against intercontinental missiles launched by Iran!—in Poland and the Czech Republic. Today, extricating their military forces from the Iraq quagmire could give the imperialists more flexibility to pursue their threats against both neocolonial Iran and the North Korean deformed workers state, and to pursue as well their strategic goal of capitalist counterrevolution in China, the most powerful of the remaining societies where capitalism was overthrown. It is particularly criminal that representatives of the Chinese deformed workers state voted on the UN Security Council to impose sanctions on Iran. The Chinese Stalinist regime has also collaborated with the imperialists in the ongoing negotiations aimed at stopping North Koreas development of nuclear weapons. We stand for the unconditional military defence of the Chinese, North Korean, Cuban and Vietnamese deformed workers states against imperialism and domestic counterrevolution. We support Pyongyangs testing and development of nukes as a deterrent against imperialist blackmail and hailed Chinas successful anti-satellite weapons test in January. Beijings aid to the effort to disarm North Korea—an expression of the Stalinist policy of peaceful co-existence with imperialism—undermines Chinas own defence. We fight for workers political revolutions to oust the Stalinist bureaucracies and replace them with regimes based on workers democracy. Such revolutionary regimes must be guided by a programme of revolutionary internationalism, fighting to extend proletarian rule through international socialist revolution.